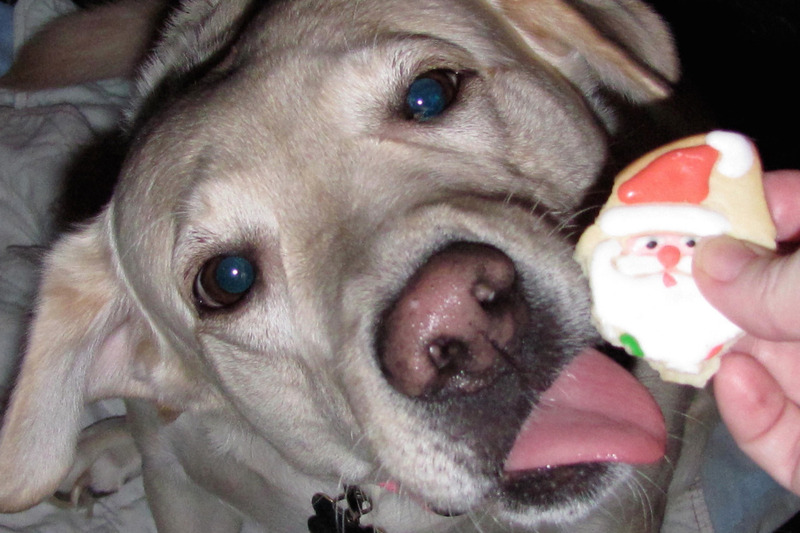 The miracle of the Rescue Ranch, a sanctuary for special needs dogs, needs your blessing/gift this Christmas/holiday. Please bless the RR dogs if you can. They need medicine, bones, special foods, special medical supplies so their skin won't degrade, supplements, so much more! The Rescue Ranch founders are struggling with staggering medical bills and could really use your help making sure that the dogs have everything that they need. 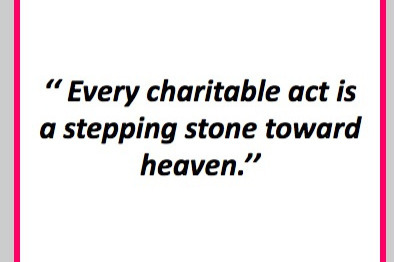 Your life will be blessed for reaching out to help. Most Needed/100% goes to help the dogs themselves--no overhead, no salaries, no fees, etc. 100%!! BURGER KING AND McDONALD's Gift Cards Needed VIP VIP VIP: Jan, 2019. Much Appreciated! Thank you for caring. Especially for caring. Special needs/disabled dogs need more help, not less, as they get older. It takes more time, more supplies, more medications, more patience, more money to keep them from getting infections, from suffering from arthritis from injuries or birth defects and to buy equipment and special foods for special diets and more. We have no idea that this would be the case. We thought if we "patched" them up and stabilized them that we could either get them adopted (no one wants to dedicate the time each takes every day) or to get them on a path to being a "normal" dog. It never really happens that way. Sure, for a month or two or a week or two, they may be stable, but then something goes awry since their immune systems are compromised or their bodies aren't as strong and we start all over again. Since we committed to them having a place to rest and be loved until God calls, we cannot just say "enough" despite the fact that we ourselves are exhaused or our finances are depleted. We made a moral commitment to these dogs and intend to keep it at all costs. We ask that you please have mercy and help us continue helping the Rescue Ranch dogs--God brought this mission before us (all) and it must be for a reason. Doing good for the least of us, is doing good for the Greatest of Us--so somewhere in our lives or in the lives of our loved ones or in the afterlife, all of our good deeds have got to catch up with us--although that is not why we do this. We take care of these wonderful, physically challenged animals because it is morally right. No one else wanted to do it and some of their stories are gut-wrenching but they didn't deserve to leave this earth in pain and in tragedy. They deserved to know love and bones and warm food and soft beds and blankets. Thank you for your continued caring and for your prayers. We believe that they all work together for good and not only bless the work that we do at the Rescue Ranch but go full circle and bless your own lives as well. Please leave a gift here if you can--100% goes to help the dogs--we can get their food, their medicine, supplies and the 100 other things they need. OR you can email a gift from amazon to a.rescue.volunteer@gmail.com or mail a gift card (Burger King, McDonald's, etc.) or prayer card to: Rescue Ranch, 4057 Riley Fuzzel Road, Ste. 500-130, Spring, TX 77386. We love you for loving these animals and for having a heart willing to reach out to help and we pray for you always. Sending always Hugs from the Herd! I woke up at 6:50 AM like I do seven days a week. These days, it is after 2-3 hours of sleep, if that. I watch a little news as I try to drink some Boost Breeze (protein-infused juice) and maybe eat a muffin. I try to be as quiet as a mouse because the minute "everyone" realizes that I am awake, duty begins and my personal time is over. The twins and Bitty have to be carried outside, one at a time. They are too little and too disabled to make it that far, from their beds to the door--Bits could walk it but he is losing his sight. 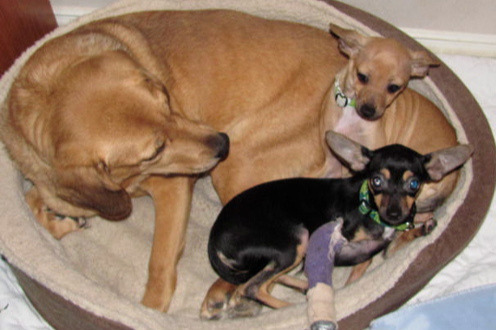 Chips, the black twin, has Brittle Bone Disease, and her front legs are crumbling into themselves as is her tail. The brown twin, Sissy, can limp out but I let her save her energy to "run" around the roses and to play with Bits--the twins both had two broken legs , one in three places each when they were found in a field at 1 lb and 1 lb, 3 oz. Now, they are 6 and 11 lbs (Chippy is the smaller). I am just getting started. But you get the idea. I get them back in, one at a time, hand-feed them water, give them snacks until everyone else goes out one at a time, then they all get fed--about five to seven different home-cooked dinners or canned or dry foods depending on how they feel that day--it seems like groups of dogs will eat the same thing if I am lucky. Last night, I only needed three different things. A relief! Today, I also cut all of their nails--at least those on the first shift. Tomorrow, I will do the next set. It will take me most of the week to get all the nails cut, eyes checked, ears cleaned. Every day, there is a blanket and bed check for special needs dogs tend to have accidents in their sleep--so 8-10 loads of laundry a day and I don't blink an eye. Watering and food is another process. I won't go into detail here but imagine adding in taking care of someone with a terminal, fast now, decompensating illness who used to need physical supervision and now, needs mental supervision--meaning, he won't or can't really do much of anything without being told what to do and when and then constant overseeing needed even with the simplest of things--most of the time. There are hours each day where "he" is himself just weaker. I am grateful for that time but I am usually too exhausted to do anything "fun" and I feel bad. During that time, he wants to go to a movie, go out for an ice cream, maybe go get something to eat, even just sit and hold my hand and watch TV. I need to be more able to drop everything, since they come without warning, and participate because I think this is the last year of his "conscious" windows of time. If we could just get help with the dogs needs, my heart wouldn't be so stressed. I sometimes wonder without all of this, or when the time comes that I can physically rest easier, will I be able to adjust! It will probably take years to be able to relax if at all. I once heard someone say (paraphrased), "Run full speed ahead during your lifetime, sliding into home base absolutely exhausted (meaning heaven, I hope)--and there you will have an eternity to rest!" I'll tell you more about life at the Rescue Ranch in another update but I wanted to share why this gofundme is here. I simply cannot do anymore without help. Thank God, or the Universe, or whatever you believe the Source of all life and love is, if you have healthy animals and a healthy family. You are very lucky. I hope that you appreciate your life and your loved ones. I can tell you that from one hour to the next, things can change even in an instant, so in this moment, be grateful and make sure that your loved ones know that you love them every single day...and leave no regrets--if you think you will regret doing something or not doing something, stop and don't do it or do it--and absorb the peace and blessings and love and happy chaos that is your life now. It is all good, even the harder things--they test and build our character and teach us how to be better, nicer, more loving, more compassionate, more of everything good, really. Thank you for helping the Rescue Ranch in whatever way that you are able. We are grateful. It's a new year--2019! Best wishes to everyone for a blessed and happy new year. We are at one quarter of our goal of the needed funds just to get through the current list of needs. Many people have visited but just a few very special people have been moved to help. I learned a long time ago that when a need comes across your path, if you are able, you always help. It is like an opportunity to bless your own life is standing before you. 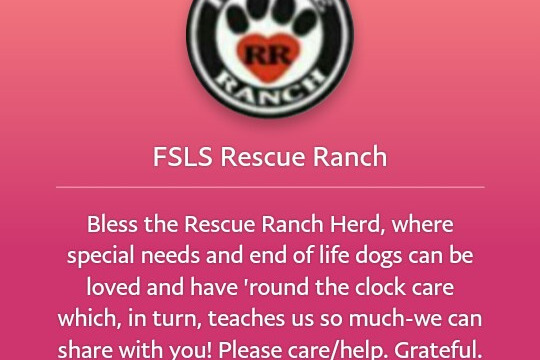 Yes, you are giving to help others--in this case 100% help the special needs dogs at the Rescue Ranch--but that becomes a blessing on your own life, too. We made a moral commitment to provide a home for the dogs who could not be adopted--otherwise they would be euthanized which was and still is not acceptable. They have only suffered before getting to the Rescue Ranch and we have an opportunity to turn their pain and suffering into love and joy before God calls them--sooner or later. While it is not your moral commitment that was made, we were given a set of circumstances to deal with that not only gave us more dogs than we anticipated but our primary benefactor was diagnosed with a terminal illness--the expenses skyrocketed as the support disappeared! In order to not break our commitment, our word, we need help continuing and as we have learned, as these special needs dogs get older and their disabilities become more pronounced, their needs and expenses increase as well. It doesn't matter in this world who you help or how you help--it just matters that you DO help--that your intention is to help someone, some animals, somewhere. At the Rescue Ranch, 100% of your gifts go to help the dogs directly instead of paying for commercials or overhead or salaries or boarding facilities. They receive 24/7 care which is so rare but they deserve it. Thank you for choosing to help the Rescue Ranch special needs dogs, or who we call, the "Herd." How do we do all of that--for a Herd of Dogs at the Rescue Ranch--without the blessings of many angels? "You can stop giving when God stops giving to you!" The man understood instantly. If he has blessings, he should share them. If he is struggling, then ask God for someone to bless him. We are struggling to provide for everyone and though angels have heard and know of our need, little help has come in December, 2018. Please help the dogs at the Rescue Ranch. 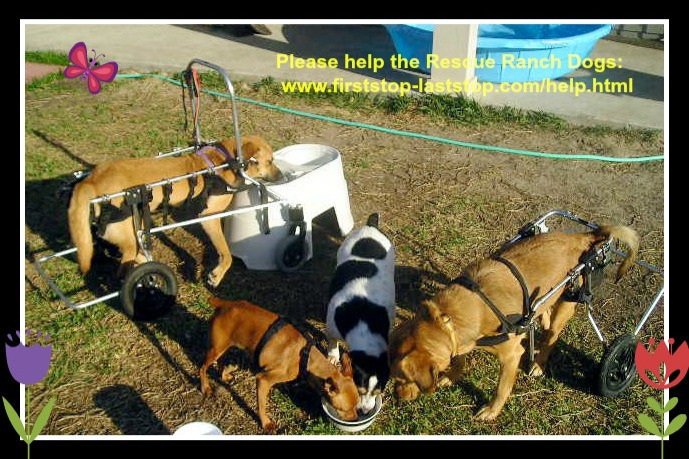 It is a very special place where no dog is ever boarded, everyone gets help eating, drinking, playing, going out--we use doggie wheelchairs, slings, harnesses and all types of dishes and foods to accommodate the different disabilities and limitations. WHY go through all of this you ask? To do the right thing. These animals did not deserve whatever happened to them before they got to the RR--and we want to right the wrongs and give them--as best we can--a life full of love, friends, full tummies and good health. When they arrive at the Rainbow Bridge in Heaven, we want them to know a better life on earth than what they would have experienced had they been euthanized after being hurt, abused, hit by a car, etc. We believe that our lives are truly blessed by helping others--not only are you doing good but you are blessing your own life. Somewhere in heaven or on earth, those blessings are building up and when you need them most--or a family member needs them--they will be multiplied and released. Thank you for your blessings, prayers, compassion, help, caring and love. We are grateful.